Welcome to “Our Way of Life.” I’ve chosen this title for my column as I believe we share a quality of life, here on Maui that is so unique. We are fortunate and blessed! I was born and raised on this island, with my paternal grandparents having come to Maui in 1910. Yes, our family is now four generations strong on Maui! The maternal side of my family is Native Hawaiian, so we’ve been here forever! As I write this, I am thinking about how I grew up. I was never called “Filipino.” My siblings and I never thought of ourselves in this ethnicity, although we knew and we learned everything our elders taught us about our cultural heritage. You know, come to think of it, none of my contemporaries had such ethnic labels. But we did eat each other’s food! Growing up on Maui, in the halcyon days of my youth, was a veritable feast of food, all kinds of food. The dishes were served and we knew what each other’s favorites were. It seems that we were always eating. No one was hungry and we all sat down to share “whatever” with each other; I still remember how each family’s table was set differently. I especially remember the old style oiled paper (later plastic) table coverings. We shared much more than food. We shared play things, hand-me-down clothes, fruits, snacks, baseball cards, oh and comic books. We also shared experiences, stories, events, performances, music and parental discipline. Actually, we shared everything. Maui was very small when I was growing up; maybe thirty thousand people lived here then. Sharing, I think, was a way of life. I still like to share and I hope this column will be something that I share with all of you. You’ve heard of the saying “Sharing is caring”? Well, I care deeply for this island; this community we share. 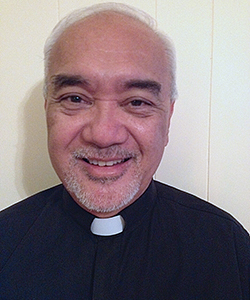 John A. Hau’oli Tomoso + is a Social Worker and Episcopal Priest. He is a Priest Associate at Good Shepherd Episcopal Church in Wailuku and an on-call Chaplain at Maui Memorial Medical Center. Tomoso was graduated from St. Anthony Jr./ Sr. High School in Wailuku and earned his Bachelor of Arts in Political Science and Sociology from the College of St. Thomas in St. Paul, Minnesota, where he met his wife Susan, who is a 7th grade Language Arts Teacher at Maui Waena Intermediate School. Tomoso received his M.S.W. from the Myron B. Thompson School of Social Work at the University of Hawai’i at Manoa in 1977. He retired from the civil service in our County Government, as the Maui County Executive on Aging in 2008 and is currently the Executive Director of the non-profit Tri-Isle Resource Conservation and Development Council, Inc. If you have any thoughts, comments or questions, you may email Tomoso at atingkabuhayan@gmail.com.